Georgina Campbell hails "a love letter to architecture and virtuosity" in her annual food, drink and hospitality awards. Composite: Georgina Campbell announcing her annual awards (Dublin in background). 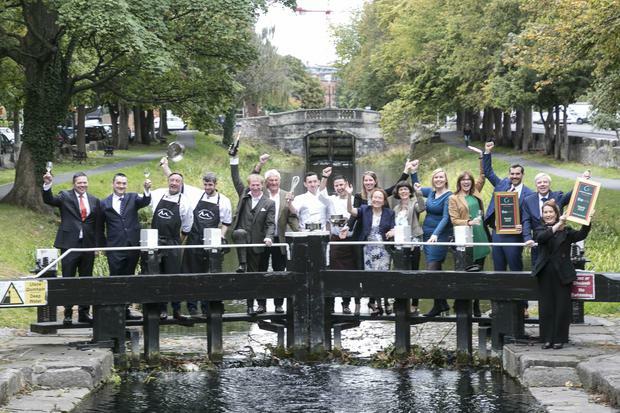 Georgina Campbell with 2019 award winners, by the Canal in Dublin. Adare Manor has been named Ireland's Hotel of the Year for 2019 at the 2019 Georgina Campbell Awards. 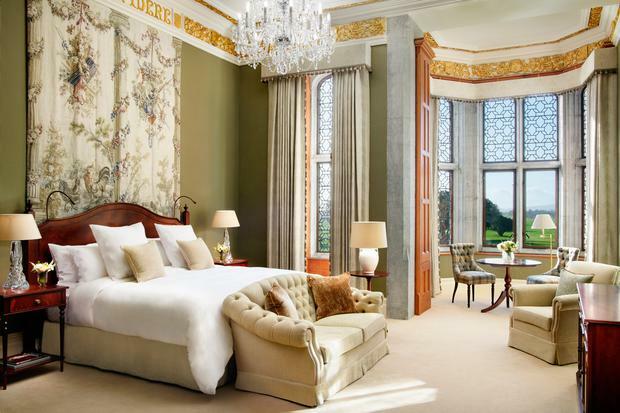 The recently refurbished five-star (read our Adare Manor review here) was described as "a stunning destination" that, for all its finery, "retains its original familial warmth". The Co Limerick resort was acquired by JP McManus and family for a reported €30m in 2014, re-opening last November after a multi-million euro restoration Campbell described as "a love letter to architecture and virtuosity". "Just as every capital city needs its great restaurants, every country needs its grand hotels," she said, hailing the family's purchase as "a good day for Ireland". The 2019 awards, held today at Bord Bia in Dublin, also saw The Strawberry Tree at Brooklodge and Macreddin Village named Restaurant of the Year, while James Coffey of the Park Hotel Kenmare was revealed as Ireland's Chef of the Year. A special 'Hospitality Hero' award was given to Ronan & Jennie Sweeney of Balloo Inns in Killinchy, Co Down, while a new, Spirit of the European Region of Gastronomy Award saw The Twelve Hotel in Barna, Beechlawn Organic Farm in Ballinasloe and Gannet Fishmongers in Galway City given nods (Galway, West of Ireland is the European Region of Gastronomy 2018). In another awards coup, Adare Manor was named 'Supreme Winner 2018' at the Hotel & Catering Review's Gold Medal Awards, held on the same day. Now in their 20th year as independently-branded (and assessed) awards, Campbell's annual selection is considered a marker of Irish hospitality trends, and a deep dive into the state of the industry. Announcing the winners, she noted the pace of change in Irish food, drink and hospitality, a crowded marketplace and "competition from new kids on the block that often motivates established businesses to up their game". Although casual dining continues to grow in popularity, "there is no sign of fine dining disappearing," Campbell said. Seafood, ethnic dining and vegetarian and vegan offerings are all on the up in Ireland, she added. As is her custom, Campbell also offered constructive criticism, noting "far too many disappointments in all areas and all kinds of establishment, including restaurants where (oddly) badly-judged seasoning has spoilt many a good dish this year." "Our least satisfactory experiences have again tended to be in four and five-star hotels (some of which would be better in lower categories), and problems are often down to simple things that could easily be fixed, plus a lack of hospitality (which often means lack of a host) and poor staff training." “Rising hotel prices are worrying, especially in Dublin," she added. 25 Christmas hotel breaks in Ireland: Skip the stress with our 2018 guide!